One of the most frustrating aspects of graduate school is that your income may fluctuate with each term. In some fields and at some universities, you might change roles not just each academic year but perhaps as frequently as each semester or trimester. When each role (fellow, teaching assistant, research assistant, graduate assistant) comes with a different pay rate, the result is a variable or irregular income. It’s even common to go without an income for a term, most typically the summer. This does not mean that you are at loose ends over the summer or free to work any type of other job. Research must go on in order for you to graduate in a timely manner! An unfunded summer – or even just an income decrease – is not at all financially trivial for a grad student, and the solutions to an irregular income that other people use are not necessarily available or optimal for a grad student because of his low overall income. Of course, the ideal situation is to secure funding over the summer from an RA position or outside grant. If that option is not available, you must consider other avenues. If you see the funding lapse coming or it occurs regularly, you can prepare for it throughout the entire year. You can take a job to replace the income you received during the academic year. It may not be possible (or ethical) to find a regular full-time job since you plan to return to your fellowship or assistantship in the fall. A temporary or seasonable job is a good alternative, whether full-time or part-time. First, look for a job that would advance your career in some way; it might help you demonstrate an existing skill, learn a new skill, expand your network, or simply look good on a CV. A paid internship is an example of a temporary job that is likely to advance your career. Second, look for a job that you would enjoy doing, even if it’s not career-advancing. Your university is a great place to start when searching out opportunities, such as a work-study position. Inside or outside your university, there may be opportunities to work with younger students who are also on summer break, such as through camps or tutoring services. Third, look for a job that pays you the highest available rate while still allowing you some time for your research and/or professional development on the side. If it isn’t advancing your career and you don’t enjoy it, just earn as much as you can per hour so you can minimize your work time. Your schedule and workload are under your control. Try to think of a unique or marketable skill that you have and how you can leverage it to serve clients. If self-employment appeals to you, you should start pursuing it ASAP, because it often takes time to start generating an income/get paid. 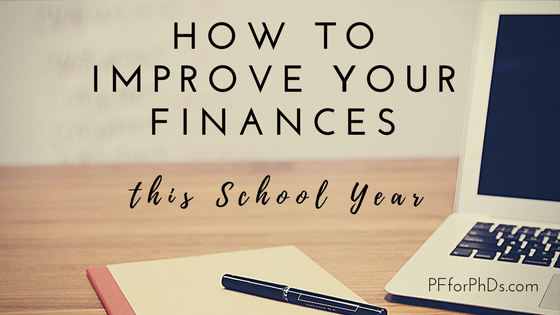 You might have to sustain your business year-round, though you could ramp it up or down depending on your academic workload. The typical financial advice for dealing with an irregular income or lapse in income is to save up in advance so that you can cover your expenses from your savings instead of your income. This is good advice for someone with an income that far exceeds her expenses. For example, if you will go three months without an income, you should save approximately one-quarter of your income from each month that you are paid to sustain yourself during your unfunded summer. Setting this savings goal ensures that you keep your expenses in check year-round while building up the account you plan to draw from. But how many graduate students are able to save one-quarter of their net income? And more so, how many of those well-paid graduate students might actually face an unfunded summer? 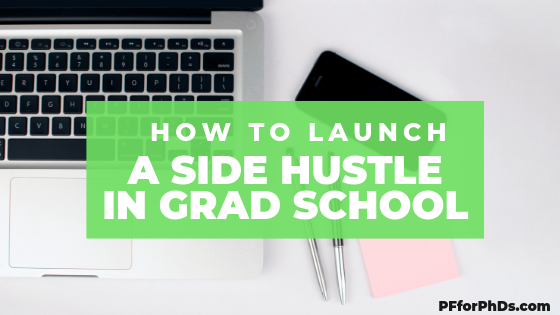 To the degree possible, you should save from your academic year income (your grad student income as well as side hustle if you have one) to pay expenses during your unfunded period if you don’t know you will earn as much from a different job/side hustle. In the face of short-term uncertainty, especially with respect to income, cash is king. But be honest with yourself from the first regular paycheck you receive about whether this plan is feasible. In the spirit of living within your means, if you are going to earn less or live off savings during your unfunded summer, you should try to reduce your expenses as well. As your largest expense is likely housing, that’s where you should look first. If there is nothing physically keeping you at your university over the summer, you can move for the term. Sub-let your academic-year home and rent a less expensive place somewhere else, move in with your parents/relatives, or house-sit. If any other of your typical expenses become unnecessary over the summer, try to jettison those as well. For example, many cities offer a slate of free activities over the summer, so you may be able to dramatically reduce the amount of money you typically spend on entertainment, eating/drinking out, etc. This is in my opinion a method of last resort and should only be used to speed progress toward graduation if a large salary bump is expected. A summer free from teaching or other service obligations can be an incredibly fruitful time for research progress – for some projects, it might be the only time when meaningful work is accomplished – so student debt can be reasonably justified for that purpose. Do some math on the ROI of taking on the debt (principal and interest) vs. your other income options for an unfunded summer to make sure it’s worth it. You don’t want to end graduate school with an amount of debt that will be onerous to pay back with your post-PhD salary, but you also don’t want to tread water in graduate school and put off earning that post-PhD salary for too long. Using student loans over the summer isn’t incompatible with any of the other options; use the other approaches to minimize the amount of student loans you need to take out/repay them immediately to the degree that they do not interfere with your research progress. Also, it is preferable to take out student loans than to accrue higher-interest rate debt (e.g., credit card debt) due to poor planning. Reducing your expenses and saving as much as you can. 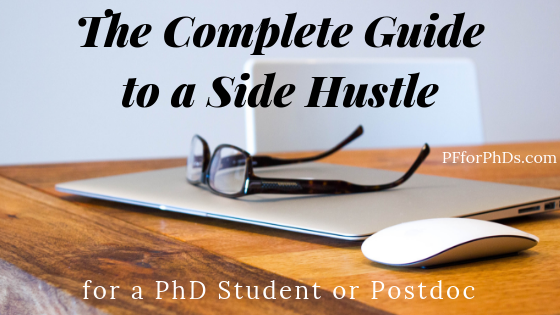 Pursuing a self-employment side hustle that ideally both pays well and complements your graduate work. 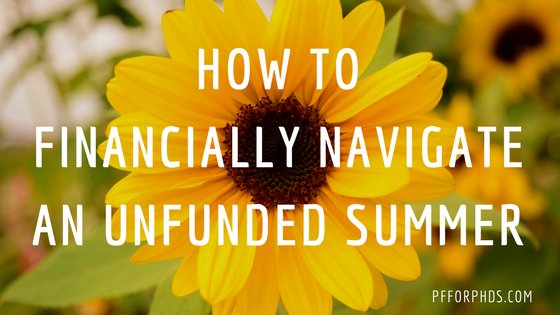 Even if you find funding for your summer and don’t need the side hustle or saved money, you will have put yourself in a better financial position and set your mind more at ease about the potential for subsequent unfunded summers. A new school year brings the sense of a fresh start, even for those of us who are largely unmoored from the academic calendar. Even with a PhD trainee’s limited income, we can harness our renewed optimism for our finances each September. If you are willing, there are steps you can take this week, this month, and this year to improve your relationship with money, your money management skills, and your net worth. A version of this post was first published on GradHacker. There is no single right way that everyone should use their money; your own individual best practices will be based on your life values. Your values are the concepts that you hold most dear; examples include freedom, fun, family, health, excellence, and so on. Identifying what is most important to you will bring great clarity to your financial decisions. You can choose to spend more resources fulfilling your values and dispense with things and activities that do not. For example, when my husband and I identified ‘community’ as one of our top values, we knew we wanted to allocate more money for traveling to visit our families and attend weddings. To enable that, we cancelled our cable TV and stopped eating out for convenience, as those areas of spending did not correspond to any of our values. A balance sheet is a snapshot of your entire financial life – every asset and every debt listed by type, financial institution, balance, etc. If you have any confusion or disorganization in your finances – or the tendency to bury your head in the sand – a balance sheet will help you see your whole situation at a glance. If you have debts, you can also include the minimum payments and interest rates so that you can easily decide which payoff to tackle first. Your balance sheet may reveal vestigial accounts or other duplications that you can clear up this week. My top financial ‘tip’ for grad students newly interested in their finances is to implement a tracking system for all their financial transactions. The simple act of tracking is often enough to start optimizing behavior. You can do this manually with anything from a notebook and pen to an app such as Wally or automatically with software that links to your accounts such as Mint or Mvelopes. Taking your values and balance sheet into consideration, list the current financial goals you would like to reach. You may be able to work on some of those goals simultaneously. For the goals that should be tackled sequentially, choose the order in which you will focus on them so that you can make quick progress. For example, if you have multiple debts you want to pay off, use the debt snowball or debt avalanche method to create your prioritized list. Trying out a new frugal strategy is a great way to unblock what can feel like an impossibly tight financial situation. You don’t have to commit to it forever – just give it a test run so that you can evaluate how much money you save and how it affects your life. (Bonus points if the frugal strategy you choose reduces a fixed expense!) You can find tons of suggestions online (example: 66 Ways to Save Money in New York City) or among your peers. Even a small amount of available cash can save your bacon in the case of an emergency. If you have nothing put aside for emergencies right now (46% of Americans surveyed couldn’t even cover a $400 emergency), set a goal of saving $1,000 for that purpose. If you already have $1,000, consider setting a larger goal based on your current monthly expenses or your insurance policy deductibles. You can add to your emergency fund with a monthly savings goal or in dribs and drabs as you free up cash. As housing and transportation eat up a huge fraction of a grad student’s income, it’s important to pay only what you can afford or – in some high cost-of-living areas – as little as is feasible. If you realize that you are overspending on rent or your car, it will take some time and doing but you can correct the situation by moving, getting a roommate, selling your car, switching to cycling for your commute, etc. There are two ways to free up more money each month: spend less or earn more. Grad students tend to focus on the “spend less” side of that equation, forgetting that “earn more” is sometimes also an option, depending on the source of your funding and your department’s culture. A judiciously chosen side job can advance your career as well as generate income, providing you with opportunities far beyond what your program can. In some situations, the best a grad student can do is keep his head above water financially in grad school, but in others it is possible for a grad student to increase her wealth. The best way to increase your net worth is to make saving, investing, and/or paying down debt regular and automatic (pay yourself first). Don’t only use frugality or a side income to free up cash flow that is then lost to the ether. Commit that cash flow to working for you through automatic monthly transfers to your savings account, investments, or loans. What are you doing this week, month, or year to improve your finances?